Indian Railway Catering and Tourism Corporation (IRCTC) will launch a new train Samantha Express on February 14 from Nagpur. The Samantha Express will cover prominent places associated with Gautam Buddha and chief architect of the Constitution Dr B R Ambedkar. The train will run through Chaityabhoomi (Mumbai), Mhow (Indore), Bodhgaya (Gaya), Sarnath (Varanasi), Lumbini (Nautanwa), Kushinagar (Gorakhpur) and Deekshabhoomi (Nagpur). About two months prior to his demise, Dr Ambedkar converted to Buddhism. 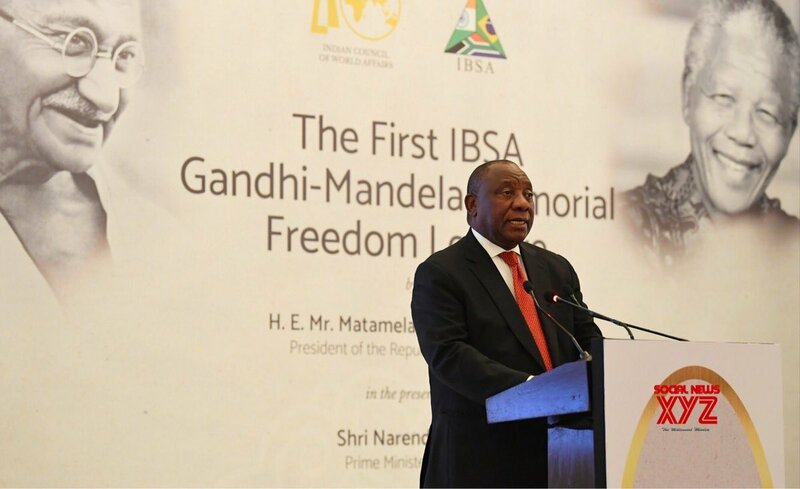 South African President Cyril Ramaphosa delivered the first IBSA Gandhi-Mandela Memorial Freedom Lecture. IBSA is an international tripartite grouping for promoting international cooperation among India, Brazil and South Africa. IBSA provides with a platform for the three countries to engage in discussions for cooperation in the field of agriculture, trade, culture, and defence among others. No Presents Please, an English Novel translated to English by Tejaswini Niranjana from Kannada Work of Jayant Kaikini, won the DSC Prize for South Asian Literature 2018. Instituted in 2010 by Surina Narula and Manhad Narula, the DSC Prize for South Asian Literature awards the best work in South Asian fiction writing each year. The Prize is awarded to writers of any ethnicity or nationality writing about South Asia themes such as culture, politics, history, or people. The Union Minister for Science and Technology inaugurated the three Department of Science and Technology (DST) mission centres at the Indian Institute of Technology Madras (IIT-M) at the collective cost of Rs 50 crore. The 3 centres are Solar Energy Harnessing Centre, Centre for Sustainable Treatment, Reuse and Management for Efficient, Affordable and Synergistic Solutions for Water and KGDS Test-bed on Solar Thermal Desalination Solutions in Narippaiyur. Australian Open which is the first of the four Grand Slam tennis events concluded at Melbourne in Australia. The Winners of the Australian Open 2019 are: Women’s Singles: Naomi Osaka of Japan and Men’s Singles: Novak Djokovic of Serbia. Novak Djokovic of Serbia has become the first man to win seven titles at Australian Open. The victory of Naomi Osaka of Japan marks her place as number one women singles player of the world. The word Nari Shakti is chosen as the word of the Year 2018 by the Oxford dictionaries. The announcement was made in the Jaipur Literature Festival (JLF). In 2017 Oxford dictionaries for the first time had announced the Hindi word of the year. Aadhaar was declared as the word of the year in 2018. Jaipur Literature Festival is described as the greatest literary show on Earth. The government of Madhya Pradesh has announced the Yuva Swabhiman Yojana to provide employment for the unemployed youth from the economically weaker sections of the society mainly in urban areas of the state. The scheme aims to provide 100 days of employment to youngsters. The youths would also be given skill training by the government. The British government has announced a research project, South Asian Nitrogen Hub to study nitrogen pollution in India and South Asia. The project led by UK’s Centre for Ecology and Hydrology will partner with 50 organisations from the UK and South Asia. The project aims to study the impact of different forms of nitrogen pollution, particularly looking at nitrogen in agriculture in eight countries of South Asia which includes India, Pakistan, Bangladesh, Nepal, Afghanistan, Sri Lanka, Bhutan and Maldives. 1. Who won the DSC Prize for South Asian Literature 2018? 2. When was the DSC Prize for South Asian Literature awards instituted? 3. Where has been the three Department of Science and Technology (DST) mission centres inaugurated? 4. Who won the Men’s Singles Australian Open 2019? 5. Which among the following is chosen as the word of the Year 2018 by the Oxford dictionaries? 6. Which state has announced the scheme Yuva Swabhiman Yojana? 7. In how many countries of South Asia, South Asian Nitrogen Hub would conduct studies on nitrogen pollution?